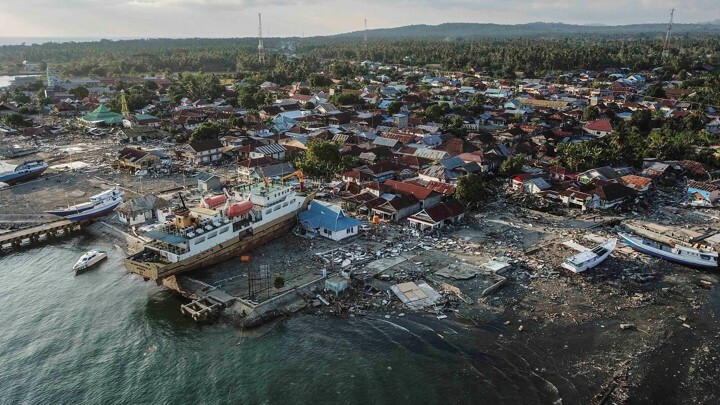 One Nation is providing emergency assistance after a series of tsunami waves struck Sunda Strait, which connects the Java Sea to the Indian Ocean at the tip of Sumatra and Java at 9.30pm on 22nd December. The powerful waves, with heights of 30 to 90cm, caused deaths, injuries and extensive damage on both sides of the strait. One of the worst affected areas was in Banten province on Java, where the disaster struck the seaside area of Pandeglang during peak holiday season when it was crowded with tourists. Officials say the tsunami could have been caused by undersea landslides after Anak Krakatau volcano erupted. As of the afternoon of 23rd December local time, the death toll was over 200 with over 800 people injured and 30 missing. A total of 558 houses, 9 hotels, dozens of houses, cars and boats were heavily damaged. Casualties are expected to rise as assessments come in. Our teams will deliver emergency packs consisting of food, water, blankets and other essentials to those affected. We will provide further assistance based on the assessments currently under way. 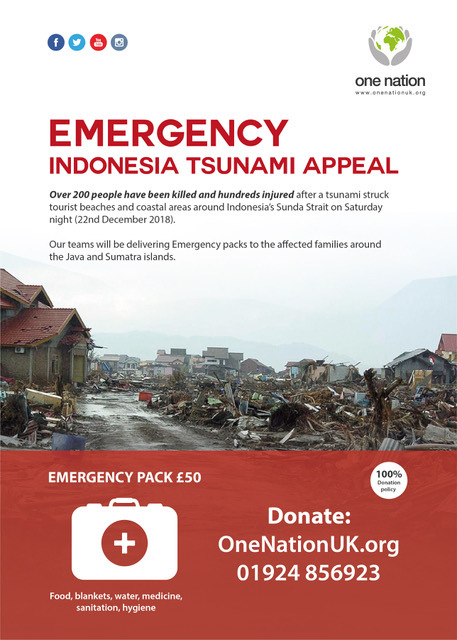 Support One Nations Indonesia tsunami appeal and help save lives. 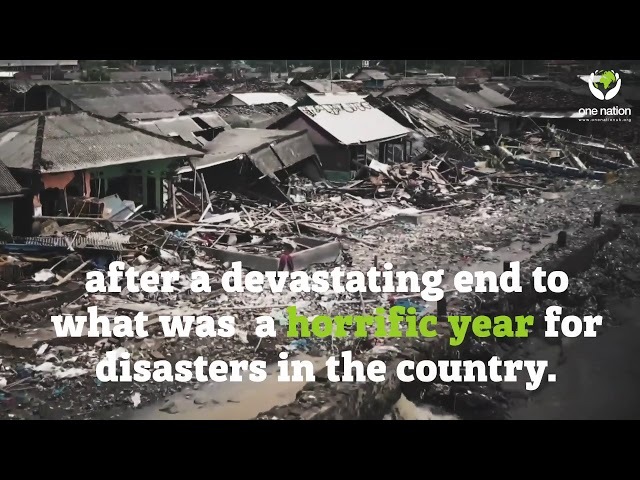 In September an earthquake and resulting tsunami struck the city of Palu on the island of Sulawesi killing over 2000 people and leaving over 200,000 people displaced. In October flash floods and landslides triggered by torrential rains killed at least 21 people, including 11 school children and destroyed hundreds of homes. Then in December another tsunami struck, damaging hundreds of homes and fishing boats. More than 70,000 houses are damaged, leaving tens of thousands homeless and resorting to living in tents and shelters, with no clear idea when they will be able to begin rebuilding their homes. One nation has been providing emergency relief and shelter for displaced families. Our team distributed food parcels on behalf of As salaam foundation to the victims of the Tsunami in Panau village, Northern Palu, Indonesia. Thank you to As salaam foundation for there kind contributions towards our projects. Our team delivered food aid and blankets to the neediest families who were displaced due to the Tsunami that took place in the Java and Sumatra areas of Indonesia in December 2018. We distributed aid in the Serang, Banten villages where thousands of families fled to, after the disaster. Many families are still in need and are needing our support. WHEN THEY SEE SUPPORT, THEY ALSO SEE HOPE, THEY ALSO SEE A FUTURE ! We pray that Allah SWT grants them all the good in this life and the next, aameen.